Explore a mystifying museum where exotic artifacts from around the globe come to life right before your eyes! Ride the Mystic Magneto-Electric Carriage to view an eclectic art collection—but beware of the newest acquisition. You’re invited to tour the manor house and private museum of Lord Henry Mystic—eccentric adventurer, explorer and collector of art—and his faithful monkey friend, Albert. Regarded as one of the foremost museums in the world, Mystic Manor was built to house Lord Henry’s ever-growing collection of illustrious art and artifacts, including a newly acquired relic: a beautifully carved Balinese music box said to make inanimate objects spring to life with its enchanting music dust. Edge your way through a labyrinth of rooms overflowing with photographs, drawings and rarities chronicling the thrilling global expeditions of Lord Henry and Albert, and—following a brief slideshow introduction—proceed to the museum’s workroom for the start of your tour. Climb inside the “wonder of the modern age,” the amazing, trackless Mystic Magneto-Electric Carriage and magically glide to the cataloguing room where the enigmatic Balinese music box is on display. Upon your arrival, a curious Albert appears and paws at the ornately carved artifact, unexpectedly causing the box to open. Suddenly, a haunting melody is heard and a stream of glittering dust drifts throughout the room and museum, miraculously imparting life to whatever it touches. Follow the mystical music dust as you embark on a mesmerizing tour of Mystic Manor, where age-old artifacts from nearly every corner of the world magically come alive—and share in Albert’s adventure as he tries to make it stop before it’s too late! Witness a musical menagerie of exotic instruments—including a harpsichord, organ, violin, flute and harp—play a peculiar tune. Behold the eruption of Mt. Vesuvius in a fresco and the mosaic of a beautiful young woman transform into Medusa. Avoid the carnivorous clutches of a man-eating plant! Feel the chill of Stribog—the Slavic god of winter—as he blankets a pleasant spring scene with frost and ice. Dodge a cannon’s blast, listen to a battalion of armor sing a bewitching tune, evade a mechanical crossbow and glimpse a knight’s uniform clutch a collection of helmets in its iron fist. Feel the scurry of a swarm of creepy-crawly bugs fleeing an ancient sarcophagus. Stare in astonishment as lava flows from the open mouth of a colossal Tiki idol before evading the clutches of a tribe of angry warrior idols. Come face-to-face with the Mythical Monkey King! It’s a tour through the ages that must be seen to be believed! During an expedition, Lord Henry Mystic discovered a young monkey entangled in the web of a monstrous spider. He rescued the monkey and named him Albert. Taken with Albert and the tropical locale, Lord Henry decided to stay—christening the area Mystic Point and his home Mystic Manor. Mystic Manor was built as a museum for the growing collection of art and artifacts gathered by members of Lord Henry’s team, the Society of Explorers and Adventurers (S.E.A.). And Albert, the foundling monkey, has become a key player in the life of Lord Henry, accompanying him on his adventures and charming members of the S.E.A. with his mischievous nature. S.E.A. is an international assembly of men and women who travel the world in search of knowledge, adventure, art and priceless cultural artifacts. They seek to bring new discoveries to the general public and to expand human knowledge and cultural awareness. Mystic Manor contains some mildly frightening subject matter. Some smaller visitors—or those who may be afraid of the dark or sudden surprises—might find the museum more frightful than delightful. 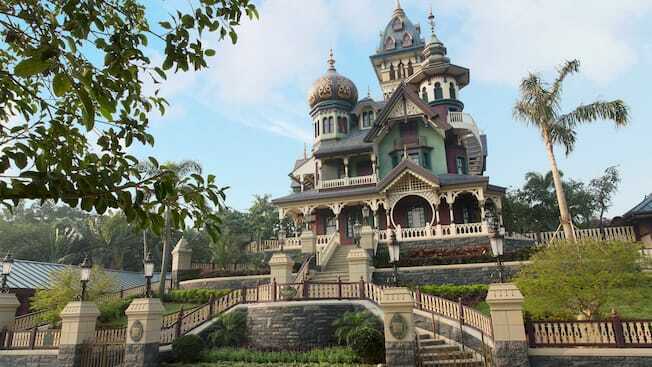 There is only one Mystic Manor and it is exclusively located in Hong Kong Disneyland Park.